Rumo is all about direction. 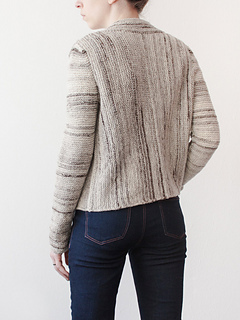 Constructed sideways in modular pieces, the cardigan is knit from the sides towards the centre four times over, using the reversibility and texture of garter stitch to its advantage. 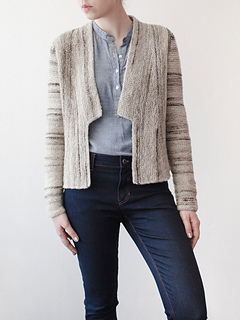 The sleeves are knit in the round and set in, creating a sleek and comfortable cardigan. 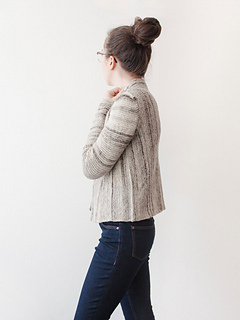 (German) short rows, picking up stitches, decreasing in stitch pattern, knitting in the round, grafting. 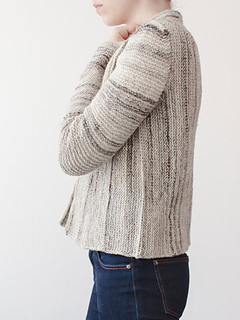 Written instructions for Modified 3 Needle Bind-Off are included in the pattern.